Downtime is real and it’s costly. How costly exactly? Depending on the size of the organiation, the cost per hour of downtime is anywhere from $9,000- $700,000. On average, a business will lose around $164,000 per hour of downtime. 1 The numbers speak for themselves. What causes downtime? 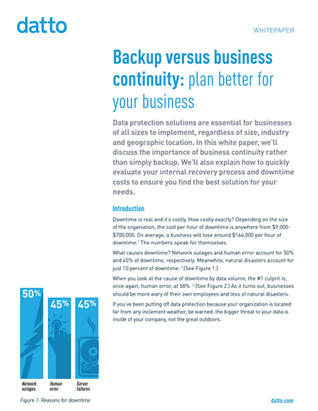 Network outages and human error account for 50% and 45% of downtime, respectively. Meanwhile, natural disasters account for just 10 percent of downtime.What causes downtime? Network outages and human error account for 50% and 45% of downtime, respectively. Meanwhile, natural disasters account for just 10 percent of downtime. 50 % Network outages When you look at the cause of downtime by data volume, the #1 culprit is, once again, human error, at 58%. As it turns out, businesses should be more wary of their own employees and less of natural disasters.